Perennial Real Estate Holdings (PREH)’s 1H18 net profit fell 75% y-o-y mainly due to absence of one-off gain and lower fair value gains. 1H18 EBIT (ex-gains) fell 17% y-o-y mainly due to loss of income from the divestment. Perennial International Health and Medical Hub (PIHMH) officially opened on 1 June 2018 and recognised maiden revenue in 2Q18. Third HSR project in Tianjin and first for Healthcare Fund. Trading at 0.5x P/BV; maintain BUY. We maintain our BUY rating with Target Price of S$1.05 (based on 50% discount to RNAV) on Perennial Real Estate Holdings (PREH). The stock currently trades at 0.5x P/BV, offering massive upside as it gradually realises its RNAV potential. Unlocking development value from strategically located land bank with partial exposure to healthcare. We are one of two brokers that cover Perennial Real Estate Holdings. Perennial Real Estate Holdings (PREH)’s hidden gems lie in its vast integrated projects in strategic locations across the main transportation hubs in China though these have lengthy gestation periods. Strata/en-bloc sales, divestment of assets, building recurring income through healthcare hub and business. 1H18 results supported by fair value gains; recognised maiden revenue from Perennial International Health and Medical Hub (PIHMH). PREH’s 1H18 net profit fell 75% y-o-y to S$14m, mainly due to absence of a one-off divestment gain, lower fair value gains and higher net interest expenses. 1H18 EBIT (ex-fair value gains) fell 17% y-o-y mainly due to the loss of contributions from the divestment of TripleOne Somerset. Renshoutang opened first PPP-project, 1350- bed eldercare home in Wuhan. Our Target Price of S$1.05 is based on a 50% discount to RNAV to factor in potential execution risks and long development/gestation periods. We have assumed marginal contribution from its new healthcare venture. Negative changes to property rules in China and exposure to RMB currency fluctuations as PREH owns a large land bank in China. Further deterioration in operating cashflows, coupled with high interest cost, may impact interest cover. Lower 1H18 net profit from lower fair value gains. Maiden revenue from PIHMH. Perennial Real Estate Holdings (PREH)’s 1H18 net profit fell 75% y-o-y to S$14m, mainly due to absence of a one-off divestment gain (S$56m) from the sale of TripleOne Somerset in 1H17, lower fair value gains on revaluation of investment properties mostly in China of S$29m in 2Q18 vs S$46m in 2Q17 and higher net interest expenses (+21% y-o-y) following higher borrowings from the consolidation of Capitol Singapore. These are mitigated by higher share of results of associates and JV of S$28m in 1H18 vs S$5m mainly due to the gains recognised from the acquisition of a 19.9% stake in WBL. Perennial Real Estate Holdings (PREH)’s 1H18 EBIT (ex-fair value gains) fell 17% y-o-y mainly due to the loss of contributions from the divestment of TripleOne Somerset. 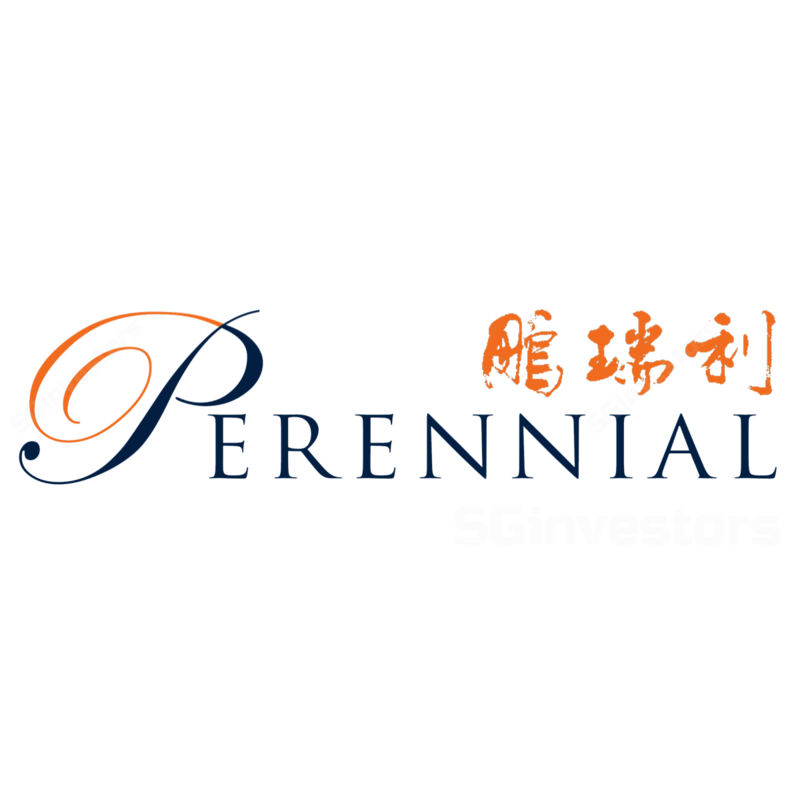 Perennial Real Estate Holdings (PREH)’s 1H18 revenue fell 13% y-o-y largely due to absence of revenue contribution following the divestment of TripleOne Somerset, partially mitigated by the consolidation of Capitol Singapore, maiden revenue contributions following the opening of Perennial International Health and Medical Hub (PIHMH) in 2Q18 and better performance recorded by Perennial Qinyang Mall and Perennial Jihua Mall. Perennial Real Estate Holdings (PREH)’s 2Q18 net profit fell 50% y-o-y to S$9m mainly from lower fair value gains and higher interest expense (+83% y-o-y), partially mitigated by higher share of results of associates and JV (+13% y-o-y) mainly from the incorporation of results with the acquisition of United Engineers in July 2017. 2Q18 EBIT (ex-fair value gains) grew 15% y-o-y. In 2Q18, PREH’s revenue grew 1.6% y-o-y, largely led by its Singapore assets (+S$1.6m; +45% y-o-y) mainly from consolidation of Capitol Singapore and its China assets (+S$1.7m; +21% y-o-y) mainly from maiden revenue contributions following the opening of Perennial International Health and Medical Hub (PIHMH) in 2Q18 and better performance recorded by Perennial Qinyang Mall and Perennial Jihua Mall. Singapore and China remain its two largest markets. Singapore contributed 25% and 46% in revenue and EBIT respectively, while China contributed 55% and 59% respectively in 1H18. As at 2Q18, net debt-to-equity stood at 0.74x (vs 0.57x in 4Q17) with an average interest cost of 3.7% (vs 3.8% in December 2017). The higher debt was mainly to finance the acquisition of the remaining stakes of Capitol Singapore. Approximately S$666m of debt is due in 2018 of which c.S$280m will likely be renewed soon, according to management. The refinancing of its remaining debt due in FY18, which includes a retail bond of S$300m due in October 2018, will reduce its cashflow/gearing risks. TripleOne L3 and L4 have obtained TOP and AXA Tower committed occupancy rose to 90.8%. On TripleOne Somerset, strata-sale units on Levels 3 and 4, designated for both office and medical usage, obtained TOP on 19 June 2018. Renovations on its retail podium is progressing well, expected to complete by 4Q18 while pre-leasing is ongoing. For AXA Tower, total committed occupancy rose to 90.8% in 1Q18/2Q18 from 88.8% in FY17. Management continues to explore en-bloc sale opportunities. Taking control of Capitol Singapore. Post the acquisition of its previous partner’s stakes in Capitol Singapore, PREH has now taken full control over Capitol Singapore. PREH has appointed Kempinski Hotel as its hotel operator with The Capitol Kempinski Hotel Singapore expected to open on 1 October 2018. Booking channels have opened for room reservations since 15 July 2018. Management is looking to do minor refurbishments in Capitol Singapore. PIHMH, Chengdu was officially opened on 1 June 2018. Committed occupancy has risen to 92.8% in 2Q18 vs 87.6% in 1Q18. A series of promotional and educational activities were held post-opening. Construction works are progressing well and construction permits for the remaining two plots have been obtained. Target completions for Phases 1 and 2 are in 2021 and 2020 respectively. Tianjin South HSR Integrated Development. Perennial Real Estate Holdings (PREH) announced its third HSR integrated project in Tianjin South on 27 July 2018. This is its first project for its Healthcare Fund which was announced in the beginning of this year. PREH won the land tender for RMB718m (S$150.3m), which translates into approximately RMB2,335 psqm of GFA. Total development cost is RMB2.7bn (S$564.3m). The station is strategically located at about 6km from the Tianjin city centre and is served by the operational Subway Line 3, with plans for three more subway lines to be launched in the future. It also connects Beijing and Shanghai via the Beijing-Tianjin-Shanghai HSR line 1. Similar to PIHMH, the Tianjin HSR project is expected to comprise a general hospital, women’s and children’s hospital, eldercare and rehabilitation facilities, hotels and complementary retail and healthcare-related businesses. The development is expected to commence operations progressively from 2022 onwards. Renshoutang’s first PPP project, 1,350-bed Wuhan Jiuzhoutong Renshoutang Xiehe Eldercare and Retirement Home was officially opened on 19 July 2018. As at 2Q18, the total number of operational beds stood at 5,006 beds vs 3,577 as at December 2017. It currently has a committed pipeline of 9,000 beds and potential pipeline of more than 13,500 beds. Maintain BUY; Target Price S$1.05. We continue to expect near-term earnings to be driven by divestment/fair value gains. In the short term, there will be additional earnings contributions from UE before potential AEI starts for some of the assets. We remain positive on its medium- to long-term development plans especially as its investments in China (and its healthcare hub) slowly come to fruition despite potential near-term financial risks. We believe the strength of its stakeholders (79% owned by its four key sponsors including Wilmar’s Mr Kuok, OSIM’s Mr Ron Sim and CEO Mr Pua, and partners and key management team) plays an integral role to execute and mitigate potential financial risks.